Successfully Added Android Tablet PC PB1 - 4G SIM Slot, Octa Core CPU, 3GB RAM, 64GB eMMC, 1920x1200 Resolutions, 6000mAh Battery, Android 6.0 OS to your Shopping Cart. The PB1 is a new 10-inch tablet computer that packs some high-end specs and comes with a modest price tag so all can enjoy fantastic media and connectivity on their tablet PC. With a 10.1-Inch display offering 1920x1200 pixels this tablet has a bright and clear screen with good viewing angles. Its pixel density of 280 pixels per inch delivers sharp and crisp images that will bring your movies and games to life. A MediaTek MT6753 octa-core ARM Cortex-A53 CPU and 3GB of RAM are behind a solid performance. This chipset includes a Mali-T720 GPU which brings support for great movie playback and ensures this tablet PC can hade graphics-rich games without any dropped frames. There are 64GBs of eMMC memory and a micro SD slot offers easy expansion letting you add up to 128GB of additional storage. This should be more than enough for even the keenest gamers and movie buffs wanting to store a large library of media. Having a 4G SIM card slot with a large range of FDD and TDD frequencies supported means you have good access to the Fastest cellular data plans around. This ensures you can stream HD content direct to the tablet. You will also be able to play online games without any dropouts or lag. 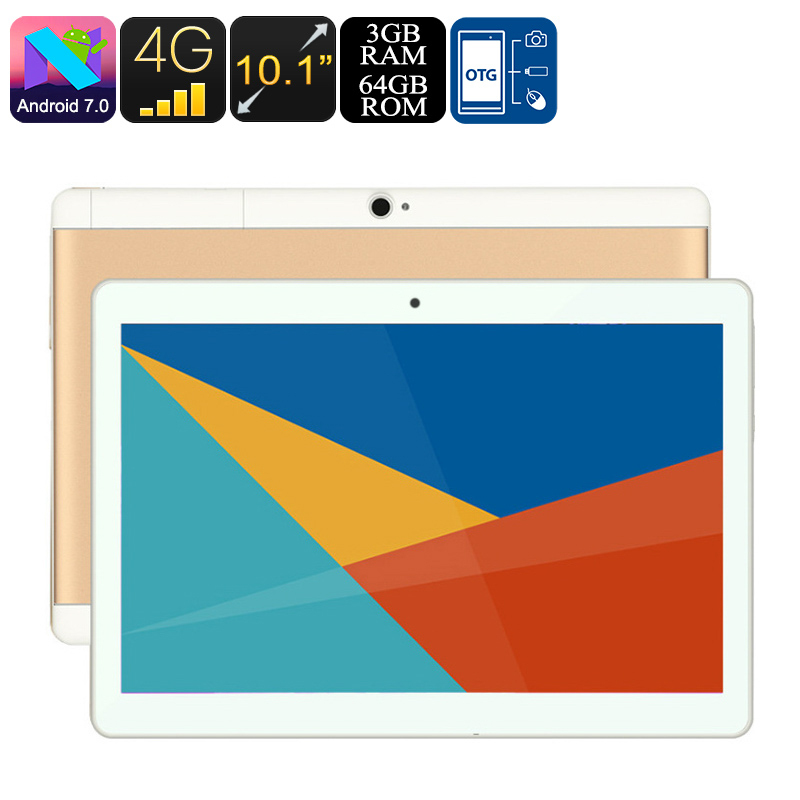 Of course with SIM connectivity you can make calls and keep connected just about anywhere so this tablet lends itself well to the needs of business users or avid gamers and media loves looking for on the go entertainment. A good size 6000mAh battery delivers respectable usage times so you will have enough power to watch a film or two on those long journeys or get some valuable work done on your commutes to the office. The Android 6.0 user interface and Google Play store bring a familiar operating environment and access to a wealth of apps for both entertainment and productivity users. This 10.1-inch Tablet PC comes with 12 months warranty, brought to you by the leader in electronic devices as well as wholesale tablet computers and cool gadgets.